Systems can be shown/hidden in the Input of Element. 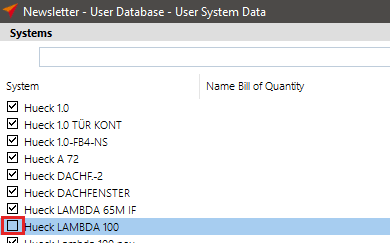 Click in the project centre in the file menu on ‘User Database’ > ‘System Input > ‘System Data’. To display a system in the Input of Element, activate the system here by checking the box next to the system name. To hide a system in the Input of Element, uncheck the box next to the system name.